One year after the record-breaking Rim Fire began in the Sierra Nevada, signs of recovery are appearing. Green ferns and small seedlings dot the forest floor. But with a full recovery expected to take a century or more, forest officials are working on plans to speed it along by planting new trees. Reforestation is common after large fires in the West, but some scientists say it’s time to rethink how forests are replanted. The Rim Fire is the largest wildfire ever recorded in the Sierra Nevada. 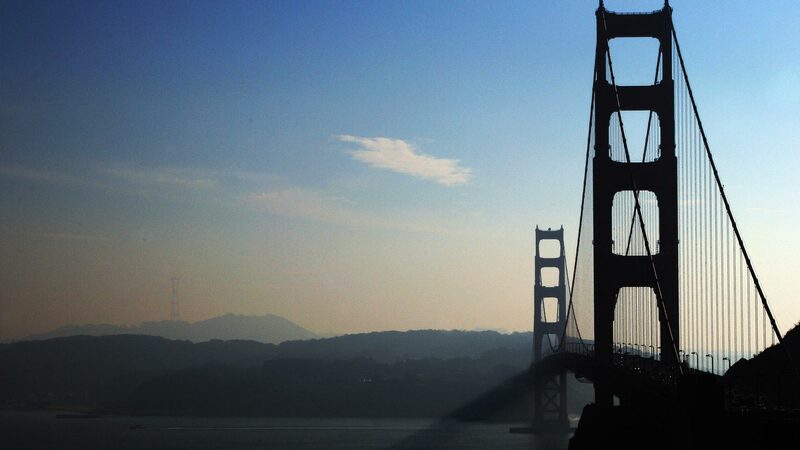 Fed by high winds and bone-dry conditions, it consumed 257,000 acres - an area nine times the size of San Francisco. A hunter recently pleaded not guilty to charges that he started it with an illegal campfire. Thousands of acres were severely burned, with trees and vegetation wiped out in about 40 percent of the burned area. Shrubs and ferns have been able to come back quickly in many places, thanks in part to California’s historic drought. Without big winter storms to create soil erosion, plants were able to take hold. “It’s remarkable even in one year what can come back,” Knapp says. Pine tree seedlings are harder to find. Knapp finally spots a three-inch pine tree. That’s how this kind of mixed-conifer forest regrows in the Sierra Nevada, he says. Green trees on the edges of a burn send their seeds into dead areas. “All the plants and trees can recolonize from the edge, but if your edge is too far away, that becomes more challenging,” he says. That’s the problem in the Rim Fire, he says. There are huge patches of dead trees and seeds can only travel so far, either by the wind or animals. The largest dead patch is more than 60,000 acres. “We estimate it could take centuries - a couple centuries - to really get that back in because there’s no seed source,” says the Forest Service’s Maria Benech. 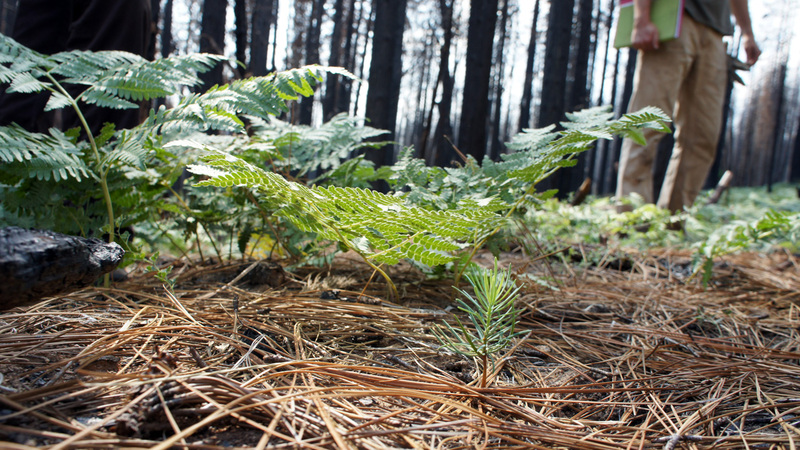 The Forest Service is working on a Rim Fire recovery plan that includes reforestation, which could begin in a year and half. The seedlings are usually planted densely, 10 feet apart. Reforestation has been done this way in the West for decades, but planting trees in the Sierra Nevada is no guarantee of success. After fires in 1987, the Forest Service replanted some of the forest, in what’s known as the “Penny Pines” tree plantation. A good part of the plantation was killed by the Rim Fire. The fire moved easily through the dense foliage. But it takes funding to selectively cut trees and create spaces in the forest. 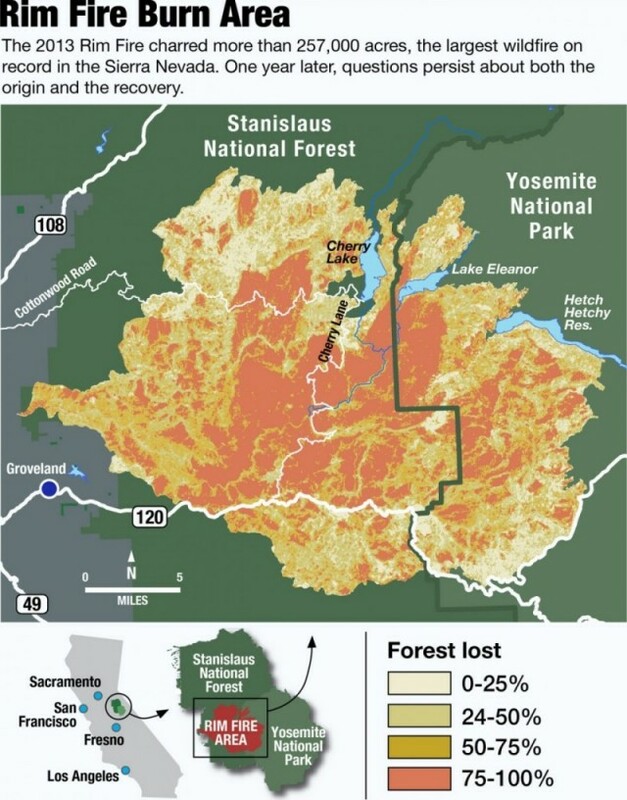 The Forest Service had made plans to do it, but hadn’t gotten the resources yet. Without that, the replanted trees went from restoration to liability. “Plantations are really prone to burning up,” says Malcolm North, a research scientist with the Forest Service and an affiliate professor at UC Davis. 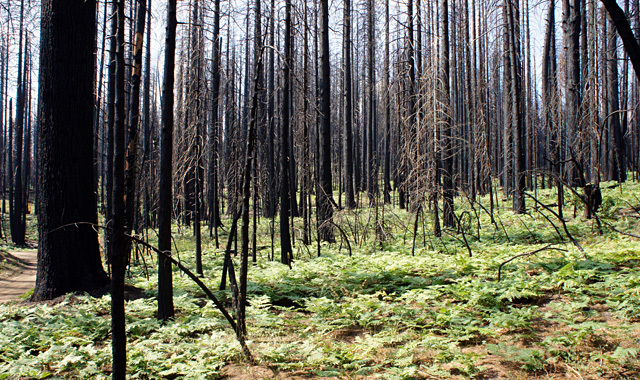 North says there may be a better way to replant trees after wildfires. Researchers have learned a lot about how Sierra Nevada forests once looked, before Smokey Bear and decades of fire suppression. Trees could be planted in a way that mimics that natural pattern – in clumps instead of rows. That could make them more resilient to future fires, North says. A team of scientists and environmental groups has been meeting to work on that idea. There’s still a lot to learn about how do that type of restoration. But that’s the silver lining of the Rim Fire, North says. With such a high profile fire comes the opportunity to learn from it.